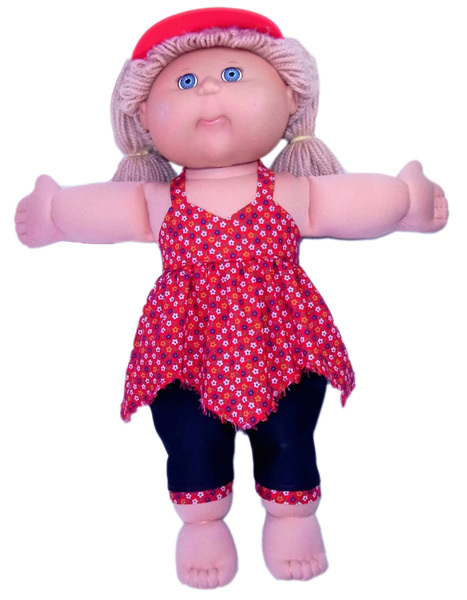 If you are looking for modern Cabbage Patch Kids Doll Clothes patterns then you will absolutely love these new Capri Pants pattern and Handkerchief Top pattern that is now available. This outfit is one of the most popular on my Rosie’s Dolls Clothes website, where I sell ready-made doll clothes and accessories, so I thought it would be great to share this pattern with you. I have jazzed it up a little with a frayed hemline on the handkerchief top and a matching trim on the Capri pants – both techniques are super easy to do and change a great outfit into an awesome one. When you purchase this downloadable PDF pattern and written instructions, I also give you LIFETIME access to video instructions streamed via my website where I show you step-by-step how to make the Capri pants and Handkerchief top for your Cabbage Patch Doll. Enjoy sewing my doll clothes patterns and I look forward to seeing some of your creations.